The first pitch last night from CC Sabathia......something is wrong. Sabathia is a hoss. A first-strike machine. Dominant. Yesterday, after just one pitch, you could tell he was lost. His pitches were up, nowhere near where Posada was setting up. Just not repeating his delivery. This season, over 50% of balls hit off Sabathia were ground balls. Last night, out of 15 batted balls, 3 were ground balls. The rest were fly balls or line drives. Sabathia walked the first batter he saw, the .265 batting Elvis Andrus, and the only guy you really don't want to walk, as he is a threat to steal. He then went 3-1 to Young before he gave him a meat ball to drive to left-center. Sabathia walked 4 in 4 innings. He had less than 3 BB per 9 innings this season. It's to the Yankees credit that they won when their ace lays an egg. But this is now too bad starts in a row—9 days apart. CC has to locate his fastball better and get ahead of the count. Texas can hit the ball—they led the majors in batting average this season—yet after an 0-1 count, their batting average as a team drops to .239. Getting ahead in the count matters that much, and usually, that's what CC is good at (and what Burnett has been so bad at this season). Sabathia pitches game 5 back at the Stadium. It would be his first Yankee Stadium appearance this playoffs. 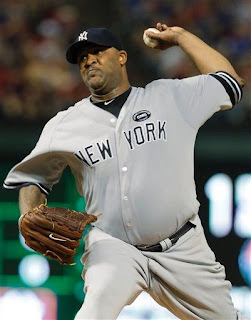 Let's hope that at home, Sabathia can find himself and his delivery. If he can't though, it will be difficult to get to the World Series. And impossible to win it. You hit the nail on the head. From pitch one, his delivery didn't look effortless like it does when he is dealing. You also make a great point...the Yankees will not be able to give leads to a team like the Phillies even if they do get by the Rangers.